I love a bit of Christmas baking, last year I worked my way through the cupcake recipes from the Hummingbird Bakery Cake Days book. I love the fruit cake cupcakes, the recipe is light and delicious and still has that lovely boozy fruit cake flavour. 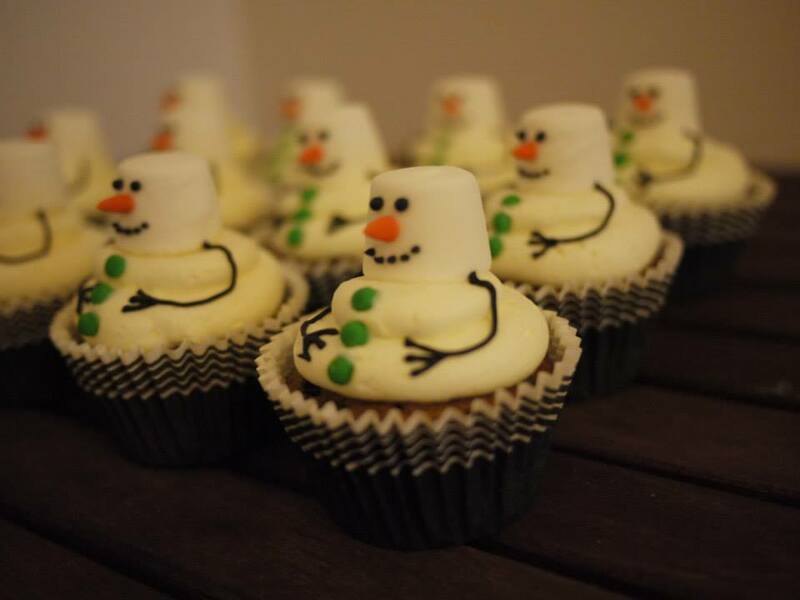 I thought these snowmen were pretty cool and as my hubby is a massive marshmallow fan I knew these would be a winner! First place the dried fruit in a bowl, pour in the rum and leave to soak for 30 minutes. In the meantime, preheat the oven to 190°C/ 375°F/ Gas Mark 5, and line a tin with muffin cases. Using a hand-held electric whisk or a freestanding electric mixer with the paddle attachment, cream together the butter and sugar until light and fluffy. Break in the eggs, one at a time, scraping down the sides of the bowl after adding each egg and mixing on a medium speed. Divide the batter between the paper cases, filling each two-thirds full. Any remaining batter can be used to fill one to four more cases in another tin. Pop in the oven and bake for 18-20 minutes or until the cupcakes have risen and spring back when you gently press them. Let them cool in the tray for a short while, then transfer to a wire rack to cool completely while you make the frosting. I had the white marshmallow ready and the buttercream made and in a bag with the largest round nozzle I have. 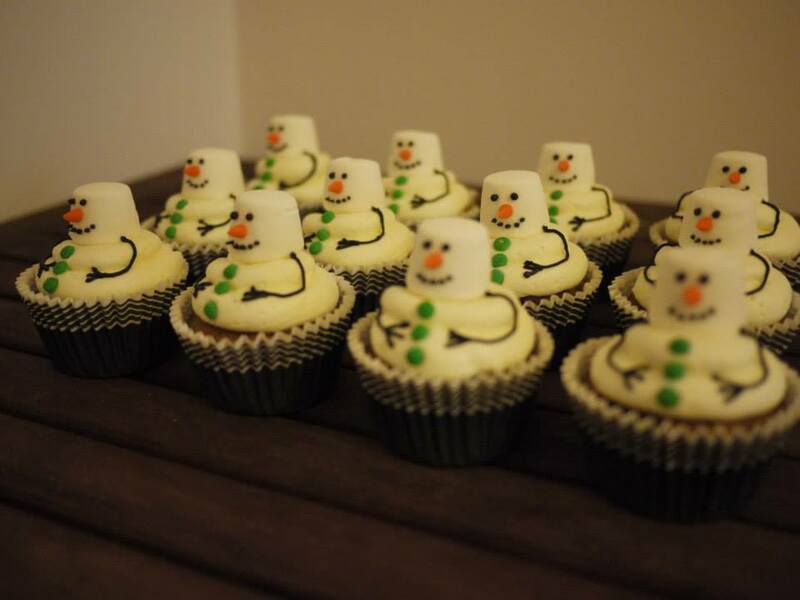 I piped tall swirls of buttercream on each cupcakes and gently placed a marshmallow on top of each. I pressed 3 green fondant balls into the buttercream to make the buttons on each cupcake. I then made up a small amount of royal icing. Before colouring it black I used a tiny bit to stick the orange noses onto the marshmallows. Then I coloured the rest of it black and put it in a piping bag with a very small nozzle, I used Wilton No. 1. I then piped on the eyes, mouth and arms. 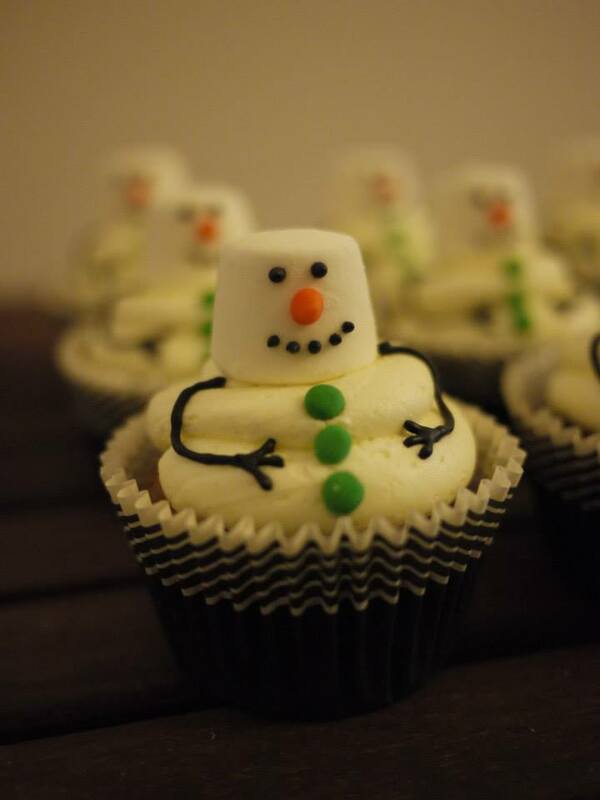 These are perfect with a cup of tea on a cold December afternoon!